Foreign policy issues will give economic matters competition for attention in the upcoming presidential debates, starting this week with the vice presidential match-up. There are stark differences between the candidates. While last month President Barack Obama called for Americans to focus on “nation-building right here at home [that is economic matters],” a new survey by the Washington, D.C.-based Foreign Policy Initiative found for most Americans (59.8 percent), the recent anti-American events in the Middle East make foreign policy issues more important in their deliberations over whom to vote for in the upcoming election. 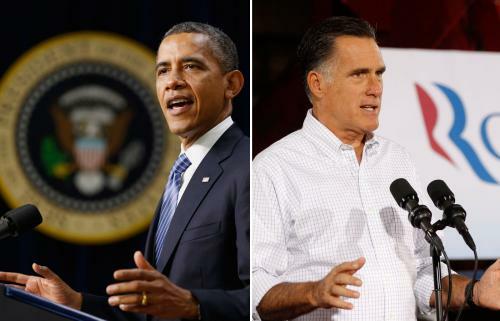 So, as Americans watch the debates, many will compare Obama’s track record and Governor Mitt Romney’s policy proposals. Below is a sample debate score card on seven key foreign policy issues. First, Obama came into office vowing to “reset” relations with Russia. That “reset” translated into abandoning our European missile defense system, without reciprocal concessions from Moscow, and signing a new Strategic Arms Reduction Treaty (START) that gave Russia room to expand its arsenal but required the U.S. to reduce its own. Russia repaid Obama’s “reset” with obstruction on Syria and Iran, more political and human rights violations at home, and Cold War-like rhetoric. And if Obama is re-elected, he intends to make a new deal with President Vladimir Putin to significantly cut nuclear stockpiles, a promise he made to then-President Dmitry Medvedev that “after my election, I have more flexibility” on that. Romney promises to “reset” Obama’s Russia “reset” beginning with a review of the START agreement. He will help reduce Europe’s reliance on Russian energy, which makes the region vulnerable to Moscow’s political pressure. Then he will enhance ties with Central Asian states which Russia threatens and confront Moscow over its renewed authoritarian practices. Second, China is the world’s second largest economy after ours and it is sharply increasing military expenditures. It intimidates neighboring states as it pursues a hegemonic regional path and stands accused of significant economic foul play. As a candidate in 2008, Obama labeled China a currency manipulator but that tough campaign talk never translated into action. The administration claims Obama demanded China address currency manipulation and threatened more aggressive action to protect U.S. intellectual property rights. But in both cases nothing substantive happened. Romney promises to pursue Beijing’s cooperation that advances economic opportunity and democratic reform. He intends to make China’s regional hegemony more costly by maintaining robust military capabilities in the Pacific and use incentives to persuade China to end its abusive commercial practices and confront Beijing’s communists regarding their denial of basic political freedoms and human rights. He also promises to work with China to commit to North Korea’s nuclear disarmament. Third, terrorism remains America’s top security concern according to FPI’s recent survey. Most Americans (61.2 percent) do not believe the threat of “additional terrorism on American soil” has decreased since September 11, 2001. But the Obama administration wants Americans to believe the May 2011 killing of al Qaeda leader Osama bin Laden ended the threat. After the killing, Secretary of Defense Leon Panetta claimed “We’re within reach of strategically defeating al Qaeda” and Obama avoids publicly declaring we still face a serious threat in spite of recent attacks like that in Benghazi, Libya. Romney indicates government agencies assigned to fight terrorism have not been given enough authority. Therefore, he intends to empower those agencies with the appropriate legal authority to dismantle terrorist groups and prevent their attacks on our homeland and overseas facilities. Fourth, our war in Afghanistan is failing. Last week we suffered our 2,000th casualty, negotiations with the Taliban enemy crumbled, and Afghan President Hamid Karzai threatened to turn to China and Russia because he claims the U.S. is playing a “double game” by fighting a war against Afghan insurgents rather than their backers in Pakistan. Meanwhile, the number of “green-on-blue” or “insider attacks” has increased substantially, accounting for 14 percent of coalition casualties in 2012. In 2008 Obama pledged to exit Iraq and focus on Afghanistan. Then in late 2009 he announced a “surge” of 30,000 troops—less than commanders requested. The surge won back territory held by the Taliban but failed to deal a crippling blow. Obama weakened our hand by agreeing to a 2014 withdrawal deadline thus inevitably ceding that country back to the enemy. Romney believes our mission in Afghanistan is to eliminate al Qaeda and degrade the Taliban to ensure Afghanistan never again becomes a launching pad for terror. He promises to order a full interagency review of our Afghan transition to ascertain how to secure our gains and train security forces enough to protect their country. Then he will decide if and when to withdraw U.S. forces. Fifth, Obama’s Iran policy failed to slow that country’s nuclear program. The latest report from the UN’s International Atomic Energy Agency indicate Iran’s nuclear enrichment program is operating at the fastest rate ever, the number of enriching centrifuges more than doubled during Obama’s term, and Iran’s fortified underground facility will soon be complete. Romney intends to eliminate the threat of Iranian nuclear terrorism by sending a clear message the military option is very much on the table. He intends to restore the regular presence of aircraft carrier task forces in the region and repair relations with Israel. He also intends to ratchet up pressure with a fifth round of sanctions targeted at the financial resources underpinning the Iranian regime and its Revolutionary Guard Corps. Finally, unlike Obama who refrained from supporting Iranian protestors, Romney intends to communicate his support for a democratic alternative to the current regime. Sixth, Obama has no coherent Syria policy. That country is in civil war, the bloodshed has spread to neighboring countries and Syria’s stockpiles of chemical and biological weapons are at risk of falling into terrorist hands. Romney says he holds no illusions that Syrian strongman Bashar al-Assad is a killer, and a proxy of Iran. The governor would pursue a strategy of isolating and pressuring the Assad regime toward transition and redouble our push for the UN to live up to its responsibilities. Further, he would work with Saudi Arabia and Turkey to drive a wedge between Assad and his military and would provide arms to Syria’s rebels. Finally, Obama instituted massive defense budget cuts to protect domestic programs thus jeopardizing the nation’s security. Those cuts started in early 2011 through then- Secretary of Defense Robert Gates’ budget “efficiencies” and then Obama lopped off another $400 billion from defense after announcing his new defense strategy in January 2012 that radically changed military posture and capabilities. Now the Pentagon faces another $492 billion in cuts that Secretary Panetta called “devastating” and the chairman of the Joint Chiefs of Staff said would result in America abandoning its status as a “global power.” These cuts result from the 2011 Budget Control Act that Obama signed but he has done nothing to stop them from taking effect January 2013. Romney promises to reverse Obama-era defense spending cuts and set a core defense spending floor of 4 percent of GDP. Further, he intends to fix the Pentagon’s procurement processes, increase shipbuilding to counter China’s rise, modernize aging equipment, and reverse cuts to missile defense.